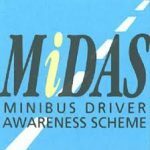 MiDAS is the Minibus Driver Awareness Scheme, administered by the Community Transport Association (CTA) which promotes a nationally recognised standard for the assessment and training of minibus drivers. The courses are designed to enhance minibus driving standards and promote the safer operation of minibuses and passenger transport. MiDAS is applicable to any organisation operating or using minibuses. Member organisations range from small voluntary organisations operating one vehicle, to local authorities operating large fleets of minibuses as well as many Care Home groups, schools, colleges and universities. The Standard course runs for one day and concentrates on driving the minibus safely and economically. The Accessible course runs for two days and covers all of the same criteria as the Standard course but with the addition of how to transport vulnerable passengers safely including those who may travel in wheelchairs. There are also refresher courses for those who already hold a current qualification and need to renew it. Certificates last for 4 years. All courses are a mixture of classroom training, theory tests and practical assessment throughout. Standard course – £105 per person – min 3, max 4 per course. Accessible course -£170 per person – min 3, max 4 per course.